This page refers to the concept of an archetypal tree of life in Jewish Kabbalah, Christian Cabbala and Hermetic Qabalah. See also Tree of life (disambiguation) for other meanings of the term. The tree of life is a diagram used in various mystical traditions. It usually consists of 10 nodes symbolizing different archetypes and 22 lines connecting the nodes. The nodes are often arranged into three columns to represent that they belong to a common category. The nodes are usually represented as spheres and the lines are usually represented as paths. The nodes usually represent encompassing aspects of existence, God, or the human psyche. The lines usually represent the relationship between the concepts ascribed to the spheres or a symbolic description of the requirements to go from one sphere to another. The nodes are also associated to deities, angels, celestial bodies, values, single colors or combinations of them, and specific numbers. The columns are usually symbolized as pillars. These pillars usually represent different kinds of values, electric charges, or types of ceremonial magic. 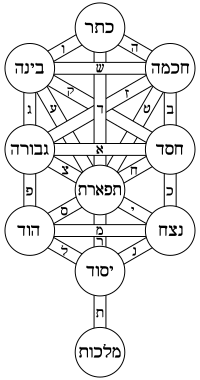 It is usually referred to as the Kabbalistic tree of life in order to distinguish it from other concepts with the same name. In the Jewish Kabbalah, the nodes are called sephiroth. The diagram is also used by Christian Cabbala, Hermetic Qabalah and Theosophy. The diagram is believed to be derivable from the flower of life. Scholars believe that the concept of a tree of life with different spheres representing encompassing aspects of reality traces its origins back to Assyria in the 9th century BC. The Assyrians also assigned values and specific numbers to their deities similar to those used by the later Jewish Kabbalah. The beginnings of the Jewish Kabbalah are traced back by scholars to the Medieval Age, originating in the Book of Bahir and the Book of Zohar. However, the first historical instance of the modern diagram appeared centuries later in the Latin translation of Gates of Light in the year 1516. The version used by modern Jewish Kabbalists first appeared in the print edition of Pardes Rimonim in 1591. 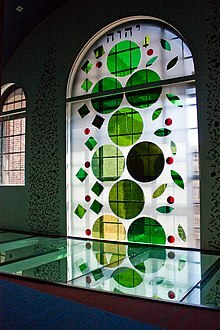 A pattern inspired by the tree of life in a window in the Joods Historisch Museum in Amsterdam. The tree represents a series of divine emanations of God's creation itself ex nihilo, the nature of revealed divinity, the human soul, and the spiritual path of ascent by man. In this way, Kabbalists developed the symbol into a full model of reality, using the tree to depict a map of creation. The symbolic configuration is made of 10 spiritual principles, but 11 can be shown, since "Keter" and "Da'at" are interchangeable. The tree of knowledge of good and evil is equivalent to the 10 spheres seen from the last sphere of the diagram ("Malkuth"), and the original tree of life is equivalent to the 10 spheres seen from the middle sphere of the diagram ("Tiferet"). Kabbalists believe the tree of life to be a diagrammatic representation of the process by which the universe came into being. On the tree of life, the beginning of the universe is placed in a space above the first sphere (named "Keter" or "crown" in English). It is not always pictured in reproductions of the tree of life, but is referred to universally as Ain Soph Aur ("Ein Sof" in Hebrew or "endless light" in English). To Kabbalists, it symbolizes that point beyond which our comprehension of the origins of being can't go. It is considered to be an infinite nothingness out of which the first "thing", usually understood among Kabbalists to be something approximating "energy", exploded to create a universe of multiple things. Kabbalists also don't envision time and space as pre-existing and place them at the next three stages on the tree of life. First is "Keter", which is thought of as the product of the contraction of "Ein Sof" into a singularity of infinite energy or limitless light. In the Kabbalah, it is the primordial energy out of which all things are created. The next stage is "Chokhmah" (or "wisdom" in English), which is considered to be a stage at which the infinitely hot and contracted singularity expanded forth into space and time. It is often thought of as pure dynamic energy of an infinite intensity forever propelled forth at a speed faster than light. Next comes "Binah" (or "understanding" in English), which is thought of as the primordial feminine energy, the supernal mother of the universe which receives the energy of "Chokhmah", cooling and nourishing it into the multitudinous forms present throughout the whole cosmos. It is also seen as the beginning of time itself. Numbers are very important to Kabbalists, and the Hebrew letters of the alphabet also have a numerical value for the Kabbalists. Each stage of the emanation of the universe on the tree of life is numbered meaningfully from one ("Keter") to ten ("Malkuth"). Each number is thought to express the nature of its sphere. The first three spheres, called the "supernal" spheres, are considered to be the primordial energies of the universe. The next stages of evolution on the tree of life are considered to exist beyond a space on the tree, called the "Abyss", between the "supernals" and the other spheres, because their levels of being are so distinct from each other that they appear to exist in two totally different realities. The "supernal" spheres exist on a plane of divine energy. This is why another correspondence for "Binah" is the idea of suffering because the "supernal" maternal energy gives birth to a world that is inherently excluded from that divine union. After "Binah", the universe gets down to the business of building the materials it will need to fulfill its evolution and be creating new combinations of those materials until it is so dense that, by the stage of "Malkuth", the initial pure limitless energy has solidified into the physical universe. Since its energies are the basis of all creation, the tree of life can potentially be applied to any area of life, especially the inner world of man, from the subconscious all the way to what Kabbalists call the higher self. But the tree of life does not only speak of the origins of the physical universe out of the unimaginable but also of man's place in the universe. Since man is invested with mind, consciousness in the Kabbalah is thought of as the fruit of the physical world, through whom the original infinite energy can experience and express itself as a finite entity. After the energy of creation has condensed into matter, it is thought to reverse its course back up the tree until it is once again united with its true nature: "Keter". Thus, the Kabbalist seeks to know himself and the universe as an expression of God and to make the journey of return by means of the stages charted by the spheres, until he has come to the realization he sought. ^ a b c d Parpola, Simo (1993). "The Assyrian Tree of Life: Tracing the Origins of Jewish Monotheism and Greek Philosophy". Journal of Near Eastern Studies. 52 (3): 161–208. doi:10.1086/373622. JSTOR 545436. ^ a b c d e f g h Mills, Robert. "Kabbalah - The Tree of Life". www.byzant.com. Byzant Mystical. ^ a b c "Tree of Life - A Thorough Explanation". Token Rock. ^ a b "Kabbalah: An Archetypal Interpretation". www.newkabbalah.com. ^ a b c d e f "Hermetic Kabbalah". www.digital-brilliance.com. ^ a b c d e Welch, John Woodland; Parry, Donald W. (2011). The Tree of Life: From Eden to Eternity. Deseret Book. ^ "The Kabbalah: A Universal Symbol--the Tree of Life". www.wisdomworld.org. ^ DovBer, Shalom. "The Tree of Life - A classic chassidic treatise on the mystic core of spiritual vitality". www.chabad.org. The Ilanot Project A searchable descriptive catalogue of kabbalistic diagrams in manuscripts and books from Medieval Age to the 20th century. Wikimedia Commons has media related to Tree of life (Kabbalah). This page was last edited on 14 April 2019, at 23:38 (UTC).